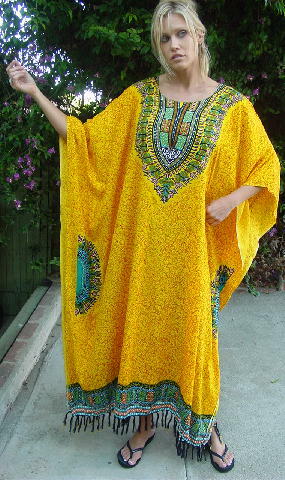 This never-worn (except for these pictures) caftan is 100% rayon and was made in India. 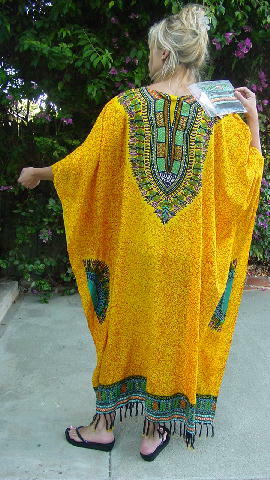 There is a 10" wide jewel neckline and it has a bright yellow background with a freeform red line pattern. The front and back have designs in purple-magenta, black, white, turquoise, orange, and Spanish olive. Along the bottom edges are thin fringes in black (some with white) with purple, yellow, white, and red tips. A plastic bag containing a fabric matching 45" by 9" scarf and the manufacturer's tags is attached. She bought two identical ones for a photo shoot. neckline to end of sleeve 19"
bottom hem side to side 44"